A Reddit user who claims to be a Ford engineer has seemingly leaked details of the Blue Oval's upcoming "Mustang-inspired" electric crossover: the Ford Mach E, which is set to be Ford's first mass-produced electric vehicle (EV). Posting under the username "LoboRaptor," this individual had claimed earlier on the site to be an engineer at Ford and posted a photo of a Ford-branded identification badge as proof (with identifying details obscured). 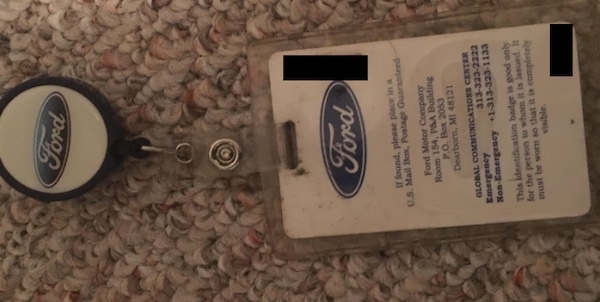 A reverse image search returned no results, meaning the photo of the badge is likely an original, though it doesn't necessarily guarantee that the user is a Ford engineer. Given the level of technical proficiency demonstrated by the comments, however, it's a possibility. The Drive made several attempts to contact the individual controlling the account, but since then the LoboRaptor profile has been deleted by its controller. Across their account history is a series of claims about future Ford products, such as an allegation that the upcoming Lincoln Corsair will be a plug-in hybrid (PHEV) with all-wheel-drive, and a claim that the Bronco and next-generation Ranger will share a platform, but most extensive are their claims regarding Ford's as-of-yet unnamed "Mustang-inspired" crossover, which will be an electric performance vehicle. We have believed since December that this "Mustang-inspired" model will be named "Mach E," based on a trademark filing from Ford that pointed to the name being used for an electric crossover, and Ford's own admission that the vehicle will be made in the Mustang's image. LoboRaptor seemingly confirms our suspicions with a reply to a question about most-anticipated new vehicles in the near future, which, if this user is the Ford engineer they say they are, would mark the first time Ford has referred to the model as the Mach E.
Claims in separate posts made by people who "have seen the Mach E" say it won't resemble crossovers as we know them and will instead look more like the relatively low-slung Jaguar I-Pace. The Jaguar tends to look ill-proportioned in photos, but shines in person, so you ought to wait to see a Mach E in person before you judge its looks. Allegedly, this won't be as far off as you might think, as the poster speculates a reveal to be in the cards for later this year and a market launch in the second half of 2020. Ford has already gone out of its way to insert itself into conversations about the upcoming Tesla Model Y crossover, and like the Model Y, this Reddit poster implies that there will be a range of Mach Es available, and outright states to "think Model Y pricing" when predicting what the Mach E will cost. One variant (presumably the most expensive) they say will do an EPA-estimated 300 miles on a full charge, in line with our US-adjusted predictions for the model. This was based on Ford's claim the Mach E will do 370 miles on a charge, as tested on the more EV-flattering WLTP cycle, used by much of Europe and Asia. Whether the longest-range and performance models will be one and the same wasn't stated, though the latter, hesitantly referred to as "GT," is claimed to do zero-to-60 in 3.5 seconds or less. All of these claims by default extend to the Mach E's eventual Lincoln fraternal twin as well, though Ford has emphasized that the upscale Lincoln won't be as much about performance, so don't hold your breath for supercar-tier acceleration in a Lincoln. In addition to information on the Mustang's electric copycat, the posts shared news to share about the Mustang. The four-door Mustang rumored last year, they say, isn't happening. But cryptically, they hinted that "there's a bigger surprise for Mustang coming that for sure will not disappoint."